This is the second in a series of monthly brewery visits. Number two is 2 Brothers. The brewery has been around since 2007 with some big awards for beers in 2010, 2011 and 2013. They are always looking to make beers to appeal to as many people as possible, which means their beers can come across as a bit basic to some crowds. 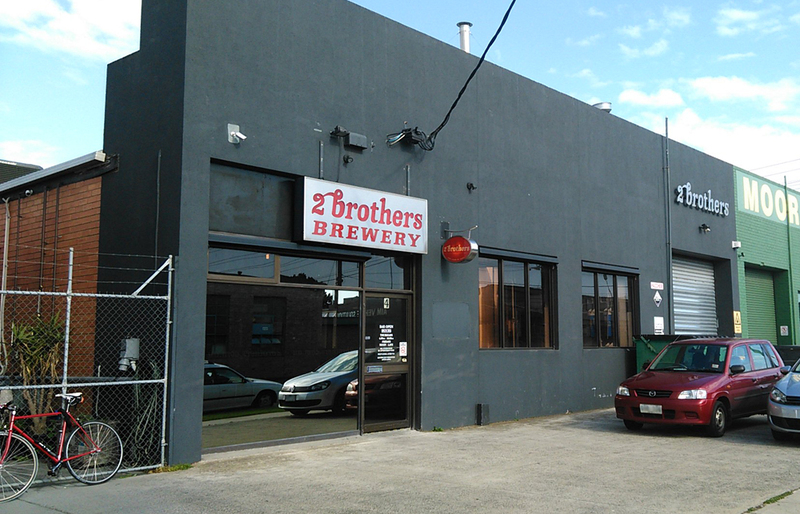 Personally I’ve never had a bad beer from 2 Brothers and would not turn down a glass. While the aim to the masses, at the same time they do a bit of experimentation on a small scale. For those turned off by the main range, these small and usually one-off batches are well worth a look. 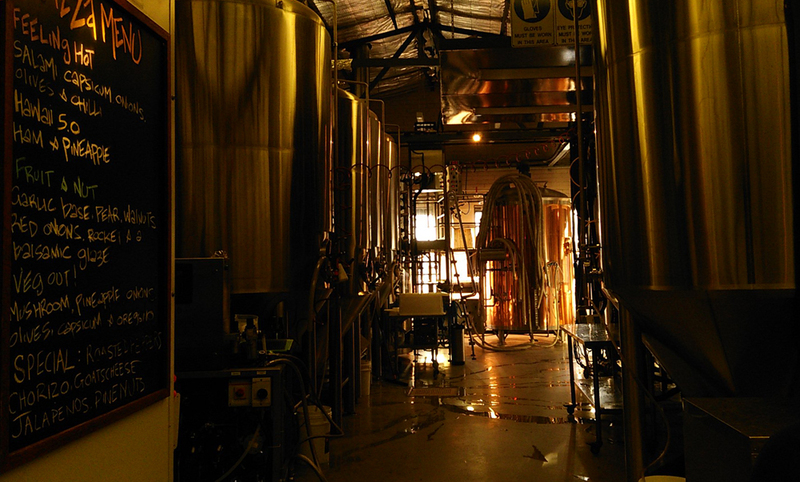 The brewery itself is down in the heart of an industrial area of south-eastern Melbourne. For visitors outside of business hours (for the factories around it) the place feels a bit like a ghost town. Getting there and home is the biggest challenge in this place. Public transport involves a 25-30 minute train, then a 5-10 minutes bus trip, then walking another 5-10 minutes. Expect an hour with connections. Or get a car there. And plan a car journey home. It really is in the middle of industrial estate. 2 Brothers Bar and list of drinks. Fridge on the side. Set up is a bit of a mish-mash from front to back. As you walk in you’ll pass under the only TV with only AFL on. 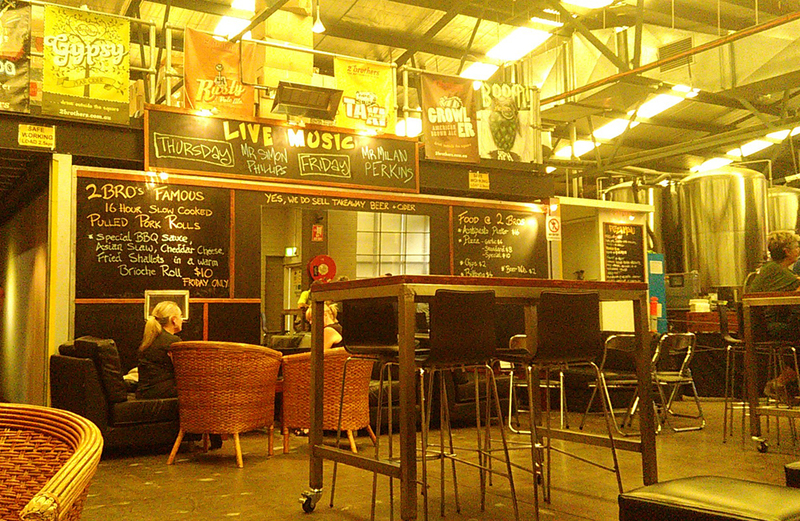 Then past the bar with seating and into the big open area with couches, chairs, tables and the stage area. Depending on the music for the night there’ll be some seating and tables on the stage. Posters and original paintings fill the walls and surfaces which nicely hides the fact that your sitting in a red brick factory. The glass windows give some charm, and somehow the red fire equipment does as well. Overall its a feeling of a nice suburban take on a bar with something for all. As the brewery name suggests, the founders are two brothers: Dave and Andrew Ong. They got the idea to start a brewery after working in the USA. Quitting jobs in physiotherapy (Dave) and aeronautical engineering (Andrew) the boys set out to start their dream brewery. All the equipment came from the Times Square Brewery from New York. The story goes that they didn’t have exactly the right permissions to do everything, so moved all the equipment out one night onto a big truck, transported everything into five shipping containers and shipped them over to Melbourne. The tanks are all on display behind the bar and have been renamed after districts in New York. 2 Brothers fermentation and carbonation tanks. Tour is held at the far end. The tour explains the history and does the obligatory explanation of how beer is made. 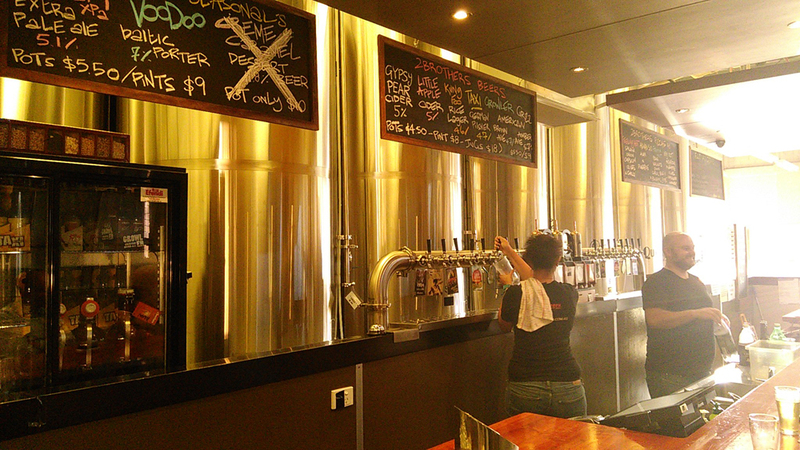 Interestingly they’ve set up the brewery bar so that the taps run directly off tanks. That means the beer is all pre-carbonated in these tanks. Then the beer is both kegged and/or bottled directly from them. Few other noteworthy things from the tour. Fresh dry yeast is used in every batch. This is one of their controls as they’re not set up to reuse yeast. Plus, as well as chilling beer to clear, they use Irish moss to help clear them up. You’ll be asked to take your shoes off and ware gumboots, which they have plenty of. So be prepared for that. And also be prepared to stand in the same area for pretty much the whole tour. The brewery is small and very little space to do a tour (small groups are best). I mentioned earlier about the aim of the brewery to appeal to the masses. That’s not something they shy away from. They deliberatly have beers like their Taxi designed for drinkers of macro lagers. And their Growler, Grizz and Rusty beers are sweet for the styles, to make it easier for people unfamiliar with more malt and hop driven beers. Their award winning Voodoo and The Guvnor are also on the sweeter side, but are still great tasting beers. Even their new (at the time) BOOM! XPA is slightly sweet. The Kung Foo rice lager is more laid back on the sweetness and a good alternative to the Taxi for people trying 2 Brothers for the first time. If it’s all not sitting well, try the Ciders people tell me thy’re really good. The taps have a bit of rotation. Don’t expect all the regulars there all the time. But you can expect cheep mini pizzas. Get them before kitchen closes 8:30 on Thursdays and 9 on Fridays. And enjoy the live music. They have someone on both night’s they’re open. If you want to know who, check out their Facebook page where they semi-regularly update. The atmosphere is pretty good here. There’s a range of regulars and semi-regulars who are there to have a good time. The music always helps. Plus the staff are pretty easy going. Work out how to get there. How you’ll get home. And how you’ll get a few mates to come along as well. Then make it happen. This place is a bit of fun. Train from city down to Moorabbin or Oakleigh Station, then bus, then walk. Growlers and party kegs (30 or 50 L). Bottles in 6 packs. Can set up a tab. No digital tabs. About 45 mins. 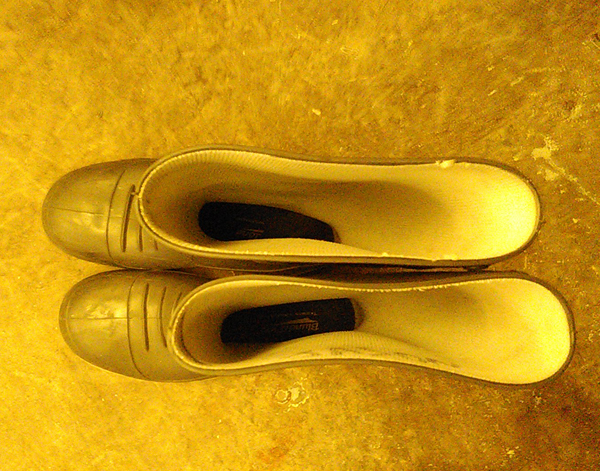 Required to change footwear to gumboots (supplied). Includes brewery history, beer brewing process, standing next to equipment. No walking around. No tasting samples. Thursday for the tour and a relaxed night. Grab a growler if going to visit regularly. Friday for fun afternoon or night. Happy Hour on Friday afternoon from 12:00 pm to 2 pm. If there for evening make sure to catch live music. Plan trip home well in advance. Very limited public transport there, much less on way home.